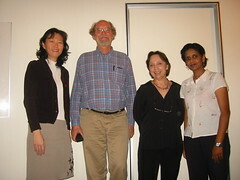 Dancing with Librarians was a talk held on 26 July 2006 and arranged by the LAS Special Libraries Section and the Goethe-Institut Singapore. Ms Heide-Marie Hartel, founder and director of the German Dance Film Institute, Bremen, Germany shared through montages, the history of the Dance Film Institute in Bremen. Her nicely accented and scripted voice-over accompanied the presentation where she paced, paused and explained through a translator the humble beginnings of the collections. Being a dancer herself, she passionately shared her labour of love which originally began as an in-house search and retrieval system for the staff at the Dance Film Institute. Dance on Demand makes available about 100 selected performances through the NLB’s digital library. “Dance on Demand is a digital initiative that brings modern dance in Germany to Singapore. A collaborative project between the National Library Board, Goethe-Institut Singapore, Deutsches Tanzfilminstitut Bremen and Universität Bremen, this multimedia collection combines digitally remastered films and videos, photographs and text to create a rich cultural experience for anyone interested in dance. Learn more about each performance piece as well as individual choreographers, dancers, and specific styles.” as described at the NLB website. Applying the principles of preservation and conservation, the project celebrates digitization and accessibility. A sneak preview during the presentation illustrated the mass appeal of the database where the simple design and ease of navigation using hyperlinks, subject-topic headings and cross-references being the hallmark of the success of the database. The non-linear way of browsing through hyperlinks allows the end-user to get an overview of the rich content in the database and pick up vignettes of information to allow learning about German film and dance through serendipity. The flurry of questions that ensued moved the presentation from a sit-down session to a huddle around Heide-Marie’s laptop where she demonstrated the evolution of the database from a simple in-house database using Access to a portal of some sorts. She shared the project management process of the project where the challenge was watching the World Cup, where Germany was a participant and the host country, and trying to finish the project on time. Perhaps luckily so, Germany was eliminated during the semi-finals! My curiosity was piqued by a series of questions that I began asking such as “Can the user get a snippet of the item? Has copyright been cleared for the materials?” to which Heide-Marie replied in the affirmative. Heide-Marie’s translator queued the questions and answered the next burning question about where could one access the database. Participants discussed the need for a similar initiative to document and capture Singapore’s dance and film collection where the National Library would be the most suitable agency leading this project. The films in the Dance on Demand database are accessible only onsite at the Library@Esplanade and the Goethe-Institut Singapore Library. My initiation into the activities of the Special Librarian’s Section (despite not being a member) was worthwhile. I networked with participants including Christina Paulini, Head Information Services, Goethe-Institut Singapore, enriched my appreciation of the performing arts, understood how Heide-Marie made her dream come true, understood the importance of documenting and sustaining heritage and collaborating through partnerships.